LOS ANGELES, CA--(Marketwired - Nov 26, 2014) - Blaze Fast-Fire'd Pizza, the nation's leading build-your-own pizza chain, opened two new Orange County locations today at Santa Ana's Westfield MainPlace and Newport Beach's Fashion Island. To celebrate the grand openings, both restaurants will offer FREE build-your-own artisanal pizzas all day on Wednesday, December 3rd during mall hours, to anyone who follows Blaze Pizza on Instagram, Twitter, or Facebook. The fast-casual concept, known for its chef-driven menu and casually hip restaurants, is now open at Santa Ana's Westfield MainPlace (2800 North Main Street) on level one, under the dining court, and Newport Beach's Fashion Island (1091 Newport Center Drive), on the mall's upper level, near Island Cinema. Blaze Pizza is a modern day "pizza joint" known for its custom-built artisanal pizzas, freshly made salads, blood orange lemonade and s'more pies. Each restaurant features an interactive assembly-line format that allows guests to customize one of the menu's signature pizzas or create their own, choosing from a wide selection of fresh, artisanal ingredients -- all for under $8. The generously-sized 11-inch pizzas are then sent to a blazing hot open-flame oven -- the centerpiece of the restaurant -- where dedicated pizzasmiths ensure that the thin-crust pies are fast-fire'd and ready to eat in just 180 seconds. Each restaurant makes its own dough from scratch using a recipe developed by critically-acclaimed Executive Chef Bradford Kent ("The Pizza Whisperer"), which requires a 24-hour fermentation period to produce his signature light-as-air, crisp crust. For pizza fans with specific dietary needs, Blaze Pizza offers gluten-free dough and vegan cheese. Both new Orange County restaurants will also feature a selection of wine and craft beer. "Our mission at Blaze is really simple -- we're all about bringing the community a place where guests can connect, create and enjoy great pizza at crazy fast speed," said Jim Mizes, president & COO of Blaze Pizza. "If you think about it, there hasn't been a good way to enjoy a made-from-scratch pizza without the wait. Now there is. We believe this will be a game changer." 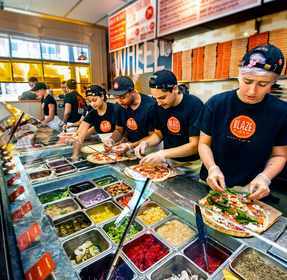 The first Blaze Pizza® restaurant opened on August 6, 2012 in Irvine, CA, and quickly gained attention for its chef-driven recipes and "build-your-own pizza" assembly-line format. Described by Zagat as "One of 10 Innovative Restaurants in Los Angeles," Blaze Pizza is developing a cult following as it expands across the U.S. The company currently operates restaurants in 14 states and the District of Columbia, including the major metropolitan areas of Los Angeles, New York, Chicago, San Francisco and Washington D.C. Founded by Elise and Rick Wetzel (co-founder of Wetzel's Pretzels), the concept is backed by investors including LeBron James, Maria Shriver, Boston Red Sox co-owner Tom Werner and movie producer John Davis. For more information, please visit blazepizza.com and facebook.com/blazepizza.